Enter our Gourmet Cheese contest, by answering the question, below (see ***). You may win this delicious Mediterranean Cheese Course Collection, from The Cheese Ambassador. 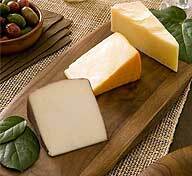 This online shop has taken the guesswork out of selecting fine cheeses and specialty foods. *** Answer the following question, for a chance to win this delectable collection. • The Mediterranean Cheese Course Collection showcases the countries of Spain, France, and Italy. What else would you include on the bridal shower menu? Share it! • Want to know more about the Mediterranean Cheese Course Collection? Owner Sara Kahn, has graciously provided a detailed description: The Cheese Ambassador presents the Mediterranean Cheese Course Collection. Steeped in centuries of cheese-making tradition, Spain, France & Italy offer some of the finest gourmet cheese in the world. Whether known as queso, fromage or formaggio, these cheeses are the definition of delectable. The Cheese Ambassador has selected a trio of cheeses in a complementary array of textures and flavors, to excite the palate and delight your guests. Ideal for bridal showers, couple showers and bachelorette parties or as a gourmet gift for newlyweds, The Mediterranean Cheese Course Collection includes The Tipsy Goat (Spain), Port Salut (France) and Piave (Italy). It also includes a cheese course guide offering tasting notes, serving tips and food & wine pairings. Serving a gourmet cheese course has never been so effortless and elegant. • After you enter our gourmet cheese contest, you may want to visit this shop. Save 15% on sumptuous cheese course collections from The Cheese Ambassador. Use code TCAA99 at checkout. • Are you a small business that would like to participate in a contest giveaway, and have your product reviewed? Then please contact us. • The Mediterranean Cheese Course Collection showcases the countries of Spain, France, and Italy. What else would you include on your bridal shower menu? Share it! Please enter your name and email address when you give your idea. Your email will be used to contact you if you win, and for future contest updates. It WILL NOT be published on the page... only your contest idea will show. Please give your gourmet cheese idea a title. Serve cheese with crackers, bread, fruits, and olives. Add some spicy Indian appetizers that will go with Cheese. Wine could be served, and different gourmet crackers could be added to the bridal shower menu. The appropriate wine and crackers for the cheese. Someone cute to distribute, so all senses are pleased.